Another week and another update about my books! 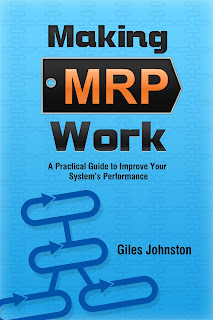 Making MRP Work, my guide to improving how your MRP / ERP system can work for your business is now available in paperback format. The book has been available on Kindle and iTunes for a couple of years now, so I am pleased to announce that is also available in paperback too. The main sections of the book all conclude with practical actions you can take in your own business, helping you to get the results you want from your MRP / ERP system. These systems really can bring bottom line benefits to businesses when they are setup and managed properly. Aimed at the practical user, this book also includes advice on managing the system (including the people who use it) and how MRP integrates beautifully with Lean Manufacturing approaches.